What is idolatry? What did idolatry mean in OT times, and what does it mean now? Does an idol have to be tangible? Do we have to physically bow down to an object or do outward acts of worship to it for it to be an idol? Can our wishes, opinions, behaviors, or even other people be idols? In the OT (NT, too), the word “idolatry” would have brought to mind the ideas outlined in 4:15-19: the worship of a carved figure in the likeness of a created being, or the worship of the heavenly bodies. Many idols/gods are mentioned in the OT, including Baal, Ashera, Molech, and Dagon, among others. Some of them were figures small enough to be kept in the home (Gen. 31). Some were larger statues in their own temples (1 Sam. 5). Some were enormous outdoor statues (Dan. 3). People physically bowed down to them, prayed to them, brought them sacrifices, served them, and did other things to try to appease them, get what they wanted out of them, and steer clear of their anger. Idolatry was simply to worship, serve, and love a created thing instead of, or more than, God. Was there really a pantheon of gods out there, independent of God, but with similar powers? No. 1 Cor. clearly declares that this cadre of gods does not exist. Is. 44 focuses on the ridiculousness of worshiping something made by man’s own hand, and out of the same material he uses for building a fire. Col. 3 tells us that covetousness- wanting anything we’re not supposed to want- is idolatry. Since “we have the mind of Christ” (1 Cor. 2), desiring that doesn’t conform to what Christ thinks and says is idolatry. In other words, any sin. Some type of idolatry is at the root of every sin. In Matt. 4, Jesus says we’re to worship and serve only God, so anything we put our trust in, make ungodly sacrifices for, serve, or allow to control us is an idol. What are some of our idols today? Do they have to be tangible to be idols? While there are certainly religions that worship tangible gods (Buddha, third world idols), idolatry today is much subtler. For any non-Christian, his idol is ultimately himself, regardless of his religion or lack thereof. Even Christians (or people who claim to be Christians) can be guilty of idolatry. What about constantly missing church in order to do something else we prefer? How about “loving” our children more than God (Ex: Staying home from church because your child doesn’t want to go, or so your child can play sports. Choosing to disbelieve or twist what Scripture says about homosexuality because your child becomes a homosexual.). What about giving more attention to Facebook, TV, a hobby, or a club than we do to God or to the other things He has told us to do? Any practice, opinion, or philosophy we cling to, despite what God’s word says about it, is an idol. Is idolatry merely an outward act, or does it go deeper? What causes the outward worship of idols? (Ps. 14) says, “The fool has said in his heart there is no God.” Jesus said (Matt. 12) it’s our hearts that map the course for our actions. Idolatry, like any other sin, starts with the bent of the heart. Are our hearts bent towards God or away from God? Our actions will follow. Godly actions follow a godly heart, and sinful actions follow an idolatrous heart. Because God knows that idolatry begins with the condition of the heart, His primary Commandment to Israel and to us is not about our outward behavior, but about our hearts. It’s not a “don’t” but a “do.” Love (Deut. 6). What did Jesus say about this Commandment? (Mark 12). We are to set all of our affections on God and exalt Him above everything else. Our actions follow our hearts. Since some form of idolatry is at the root of every sin, we’re all guilty of idolatry multiple times a day. What can we do about it? Nothing. Not a thing. 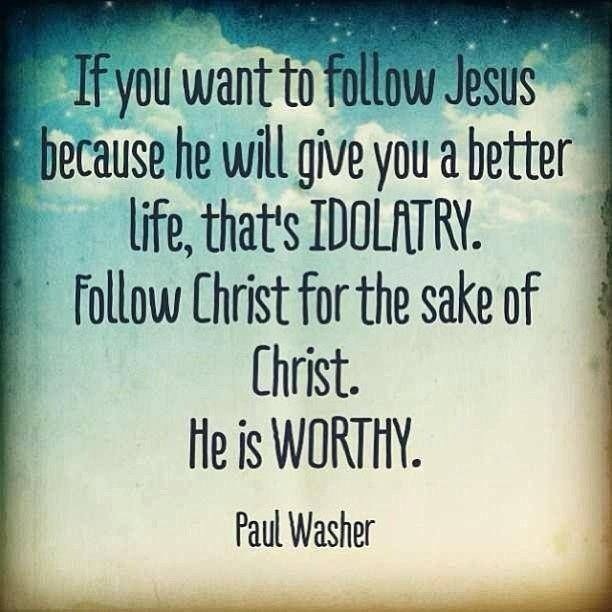 We can’t just make a decision not to commit idolatry anymore. It doesn’t work. We’re going to keep sinning. The ONLY one who can do anything about our idolatry is Christ. He died for our sin of idolatry and set us free from its power to enslave us. We are saved by His grace, and it is His grace that sanctifies us (makes us more like Him). While we can cooperate with Him by obeying what His word tells us and resisting temptation as we are empowered to do so by the Holy Spirit, we cannot “pull ourselves up by our bootstraps” and clean ourselves up from our idolatry and do better next time by our own effort. But as Christ works in us, He conforms us to His likeness. When we commit idolatry, we must run to the one true God, throw ourselves on His mercy in repentance, and receive His forgiveness and cleansing.